Aka Cappi, named Captain hook for his cool hook-shaped marking on his face. Cappi is a fun-loving, chipper, little fellow who is always ready for the job. 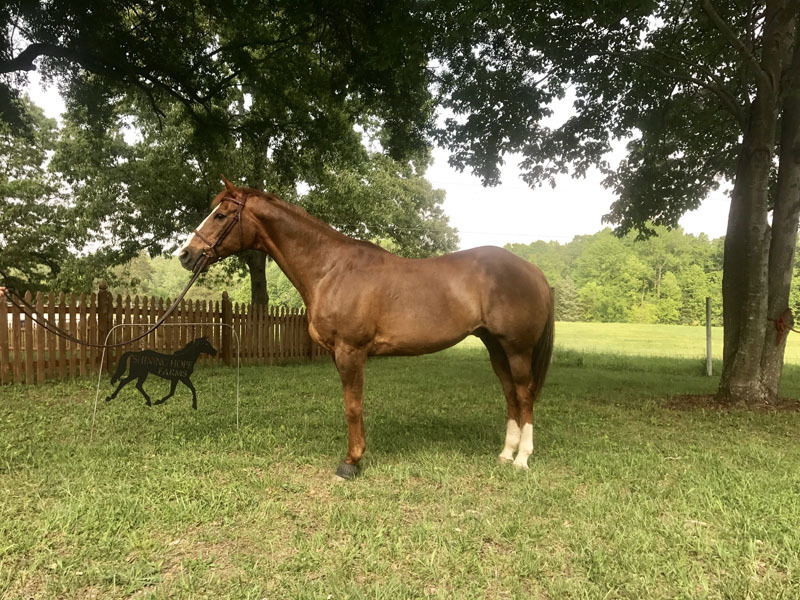 Standing at 13.1hh, this chummy gelding is a liver chestnut Shetland pony cross, foaled in 2001 and is owned by Delane Clark who generously allows him to be used for the programs at SHF. Captain Hook has a doppelganger among our horses at the Mecklenburg location. Desmond is a handsome, bay Arabian, born in 2002, who joined our program in 2016. Contrary to most Arabian horses, Des is a quiet and consistently calm equine, who is not easily spooked. Des’ energetic gait, three-dimensional movement, and sturdy but narrow 14.3 hh build makes him an asset to SHF’s Hippotherapy Program. Desmond loves trail rides and demonstrates the great endurance that Arabians are known for. Desmond was graciously donated to Shining Hope Farms by Penny Hudson. Everyone can’t help but love Dunkin. Just imagine a roly-poly horse eating a box of donuts and getting his belly scratched. That about sums it up. 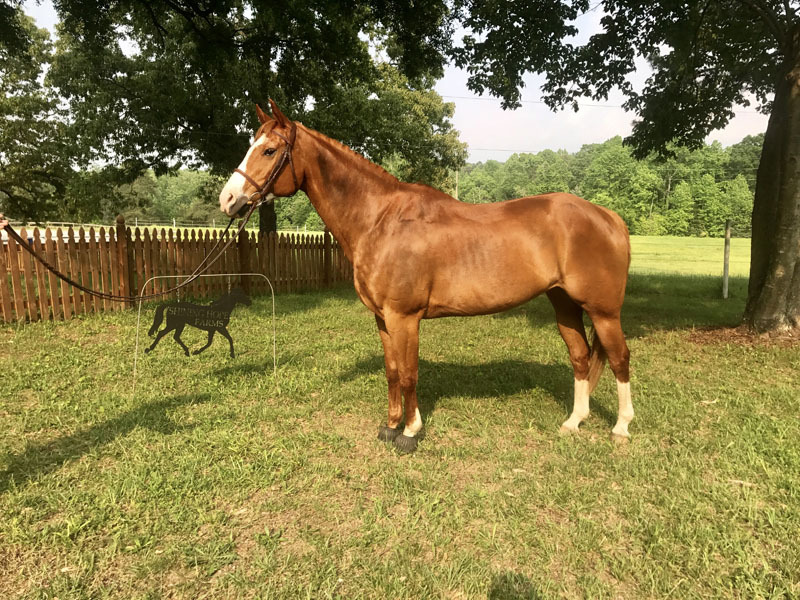 This laid-back American Foundation Quarter Horse came from the ranges of Colorado and has a ranch brand to show for it. But he’s much happier at his current job – herding cattle takes too much work! Dunkin was born in 2001, 15.0hh dun gelding who is usually easy to spot with his mo-hawk mane & zebra-striped legs. 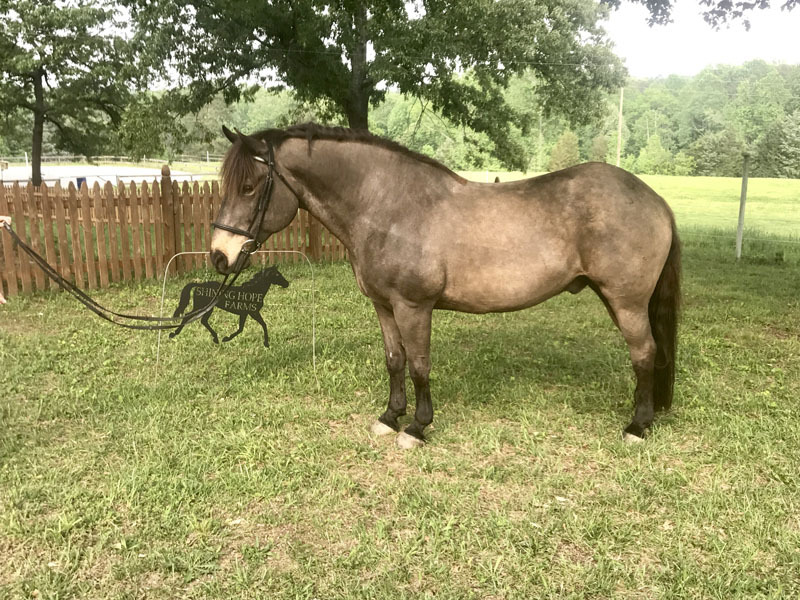 Epic aka Epic Splash is a 2007 grey Welsh Pony cross. This athletic pony is a natural at being a therapy pony. With beautiful three-dimensional movement and a great mind set he happily carries our clients through their therapy sessions. Epic loves cuddling with his riders and loves getting groomed and eating treats. In his former career, Epic was a very talented hunter pony and still occasionally loves to jump around small courses. Epic loves trail riding and playing in the water. He also enjoys rolling and is known for finding the dirtiest spot in the pasture to roll in especially after a thorough bath! He is definitely a barn favorite. Epic is on a generous donated lease from the Smith Family to Shining Hope Farms. 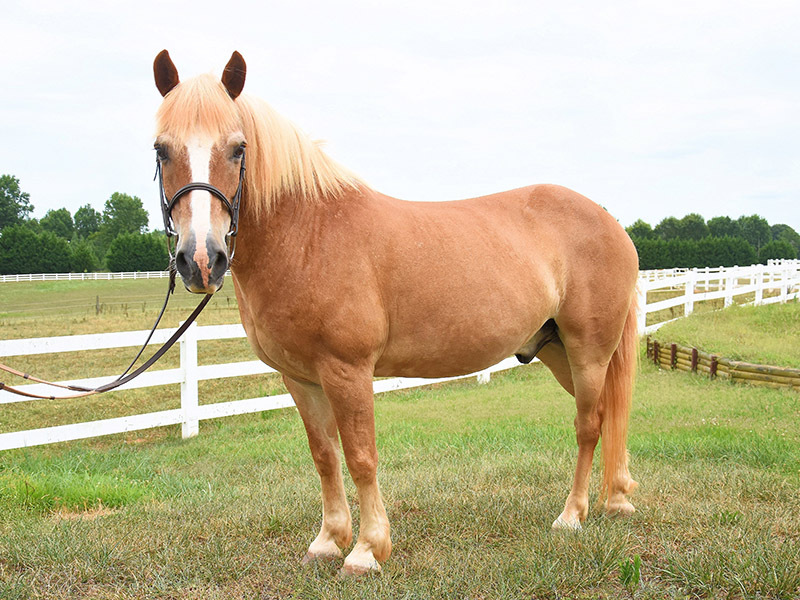 Fritz is a handsome blonde Haflinger gelding, standing at 14 hands high. He is one of the most popular ponies at SHF for his humorous personality and cute looks. This guy not only works in the SHF programs, but also can be seen regularly at horse shows competing in dressage, sidesaddle, and jumping. He enjoys being doted on by his owner, Madison Hood-Bowker. But Fritz does his best work in our hippotherapy program. He loves serving the kids, especially those that are highly involved. Compared to his training, to him, hippotherapy is not work and he is happy to plod around all day. Shining Hope Farms’ famous gentle giant is the heaviest equine at Shining Hope Farms. The Percheron/Quarter Horse gelding carries beginner adult riders safely and smoothly in riding lessons. With his even pace and his rhythmic gates, he builds confidence in timid riders. Gideon loves getting groomed, usually falling asleep in the crossties, but especially enjoys long trail rides. Gideon was partially donated by Wendy Cracovia. Jokingly we like to call him “Flash Gordon” – an oxymoron as his favorite activities are to eat, sleep, and stop – anything but move fast. He loves his job, taking things slow in stride and is best choice for the timid rider. 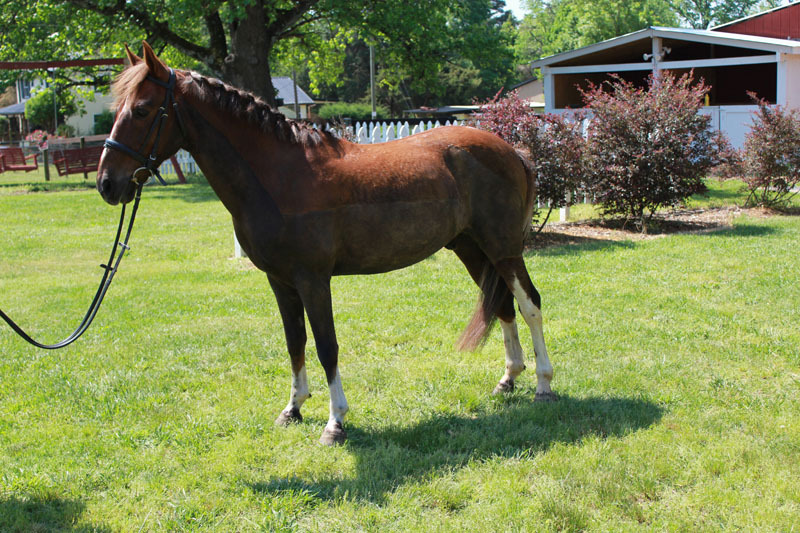 Gordon is a handsome liver chestnut American Quarter Horse gelding who stands 15.2hh. Born in 1994, he is now on senior status. He was graciously purchased for SHF by an anonymous donor. If you guessed this pony is Oreo’s brother, you are correct! More exactly step brother and their personalities are quite different. Grady has spent many years showing in Pony Club and eventing competitions before slowing down to riding lessons and hippotherapy work. Born in 1997, he is one of our best Hippotherapy and lesson ponies because of his excellent ground manners and extensive training. 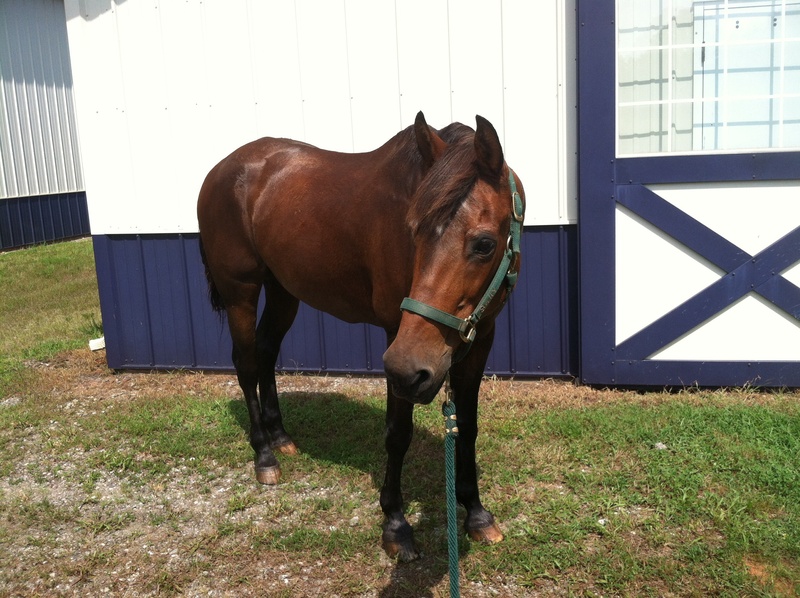 Clients love him for his smooth gaits and narrow build, as well as his willingness to work. 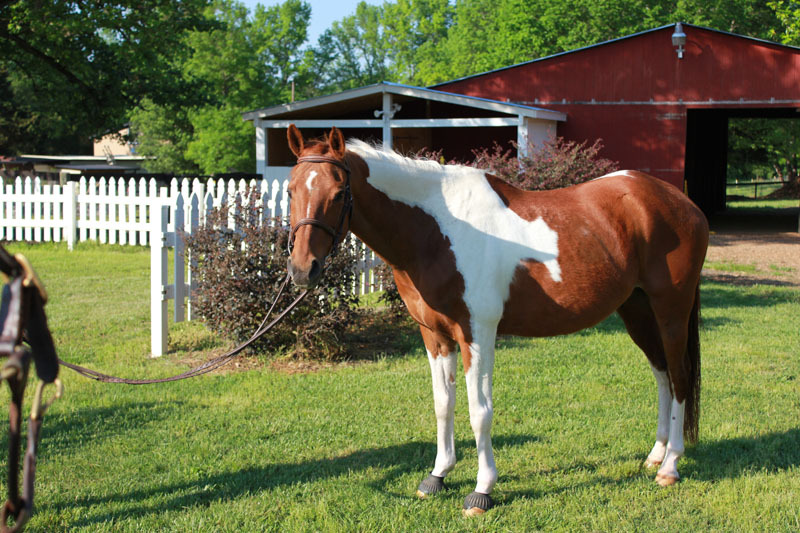 Grady stands 14.2hh and is a red chestnut and white tobiano half Arabian/half Paint gelding. He was generously donated by Stephanie Piatt, a SHF Occupational Therapist. Hamilton is a rescue pony. Saved from a bad situation and later donated by police officer Gina Cook, he is now eagerly improving the quality of life of many of our clients. Better known as “Hami,” he is one of our most lively ponies at SHF – nothing phases him in the surroundings and he really likes to move! Clients who have trouble focusing or feel at ease with a lot of sensory input, love to ride Hami and his bouncy gaits. 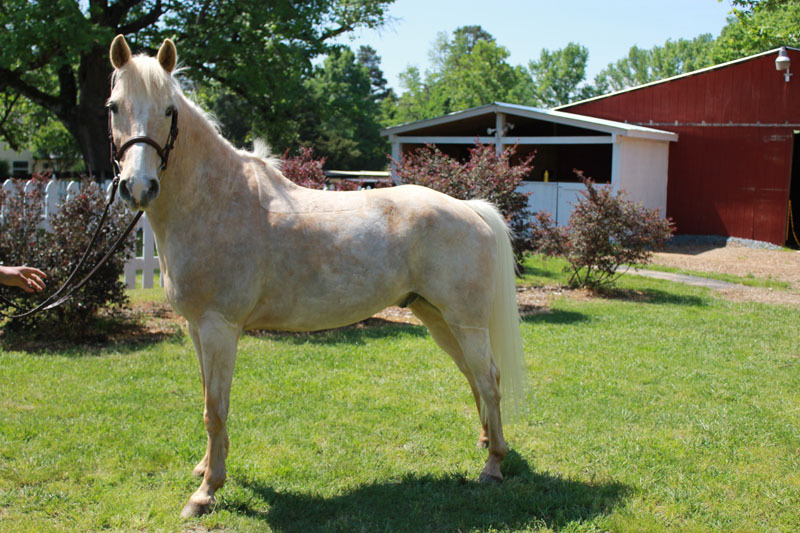 Hamilton was born in 2004 and is a 14.2hh palomino POA (Pony of the Americas) gelding. Hamilton also loves to jump and trail ride. Howard is a 16.1hh paint x draft gelding foaled in 2004. Howard is a PMU foal and was rescued by Dana Dewey of Foothill Equestrian Center. Howard is a beautiful big boy with three floaty gaits and shows promise in the Dressage arena. Howard loves scratches, being groomed and most of all being outside with his horse buddies. In the past, Howard has done extensive de-spooking and braveness training, i.e. riding alongside fire, through obstacle courses, and staying calm around loud noises. 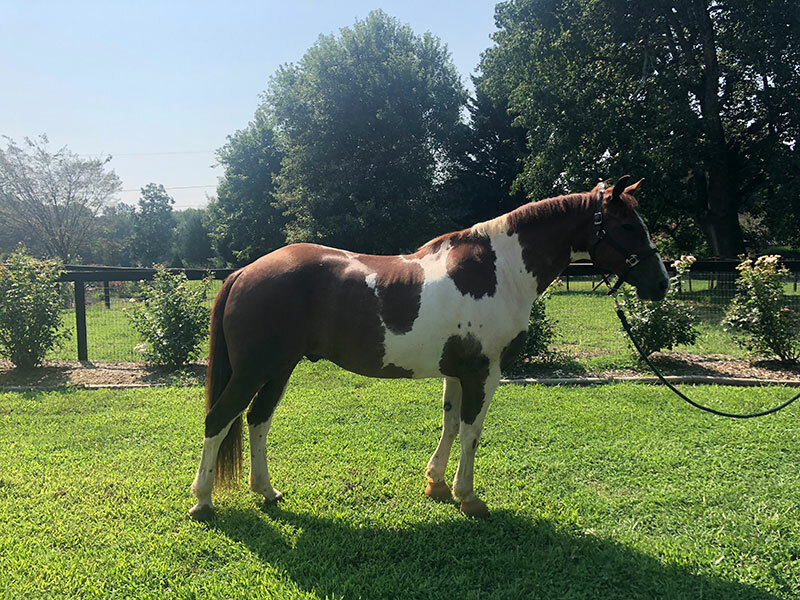 Howard enjoys trail riding and loves the water: In the summer you will find him trying to stand and swim in his water trough in the pasture and teaching the other horses to do so as well. Leo – aka Leo Lionheart- is a Gypsy Vanner x Quarter Horse born in 2015. Leo is doing amazing in his training as a therapy horse and thanks to his quietness and boldness will join our therapy program in the near future! Leo’s perfect heart on his forehead has already made him a barn favorite! Lewis is a 15.3hh registered Paint, foaled on March 22, 2002. The athletic chestnut looks like a younger version of Gordon, and the two of them are often confused for the other. Lewis, who was donated to SHF by Maddie Hazelbaker, has taken over most of Gordon’s workload and has become central to our program. Lewis really does it all- from Hippotherapy, beginner lessons, to Cross Country Jumping, and Dressage competitions-Lewis always shows a great attitude and lots of patience with riders and handlers. Lewis loves to swim- in fact he is the reason we had to fence in the meadow adjoining the little pond at the Mecklenburg location. Lewis simply swam through the pond regularly to graze on the other side. Macy is an adorable, chocolate pony born January 2012. Macy joined our program in October 2018 at our Conover location and has quickly become best friends with Sally. 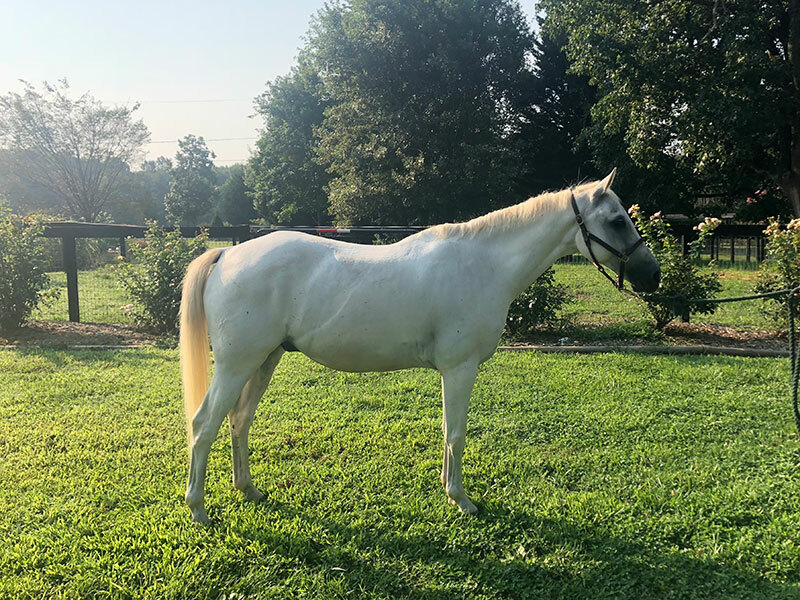 This sweet-natured pony, standing at 13.3 hands, is in training right now and is enjoying all of the love and scratches she receives from the SHF staff and volunteers who are quickly falling in love with this smart, good-natured little girl. 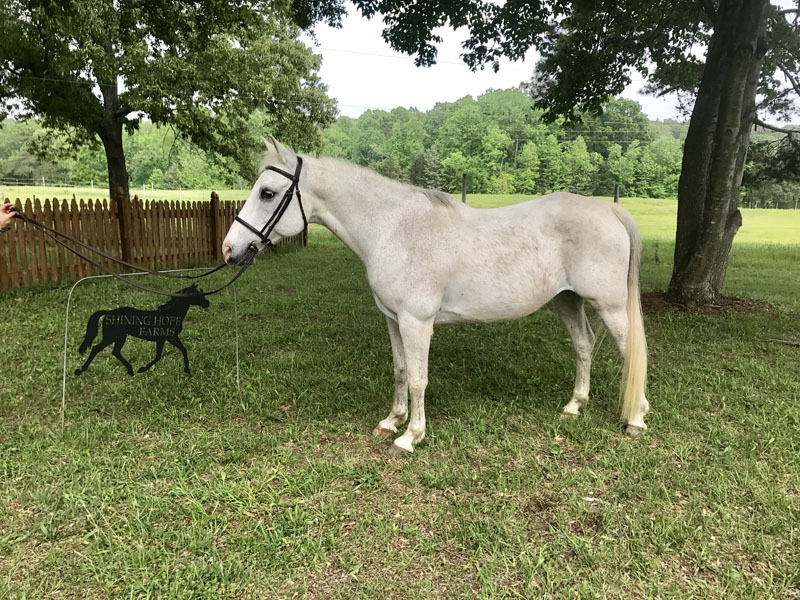 She has beautiful movement and a narrow build that makes her well-suited for becoming an all-around pony and SHF is very excited to have her as a permanent resident on the farm. 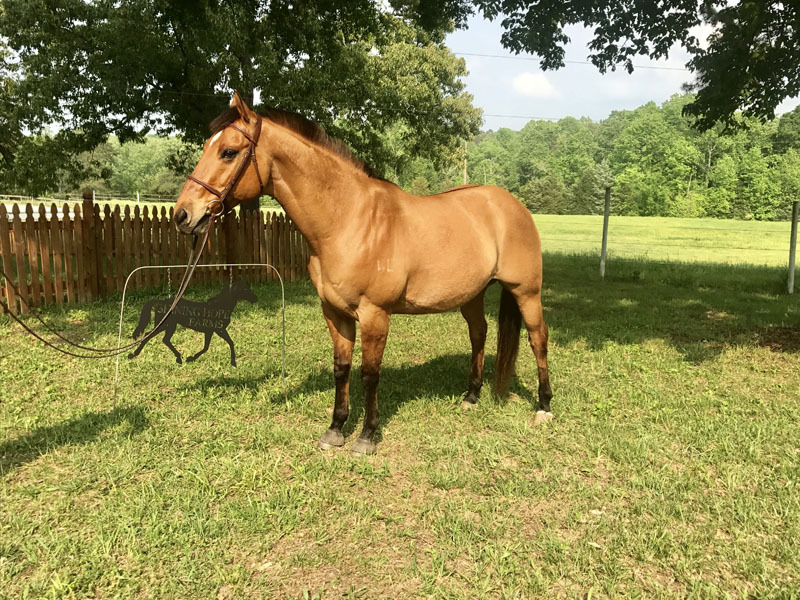 Marshall, also known and loved as ‘Marshmallow,’ is a 1998, 15.3hh bay Appendix Quarter Horse gelding. He is known for his amazing ability to sense the kind of rider he is carrying on his back- slowing it down for the more anxious, or smaller rider and speeding it up for those who are able and wanting to do more. Marshall is always ready to work, forward thinking, and keeps his riders attentive. 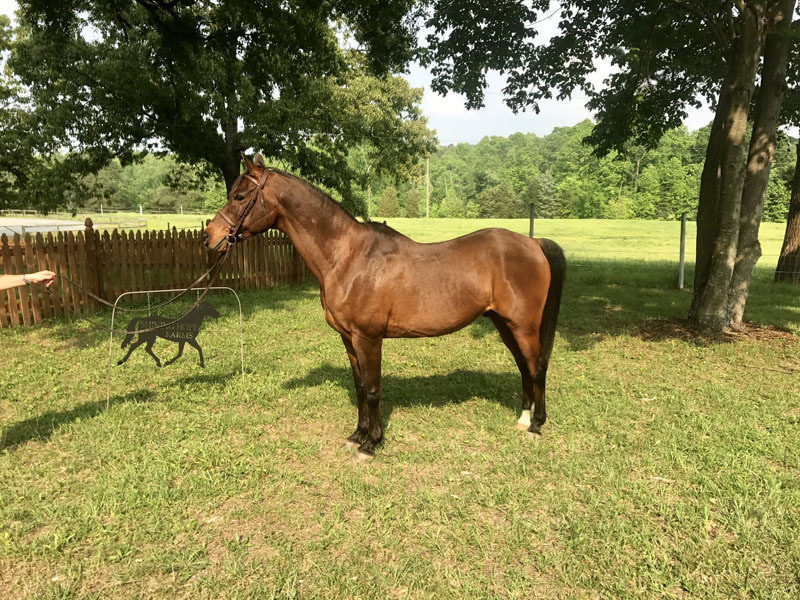 Marshall is a reliable partner on trails and in the arena, enjoying both riding lessons and Hippotherapy, and loves trail riding and is also a talented jumper. 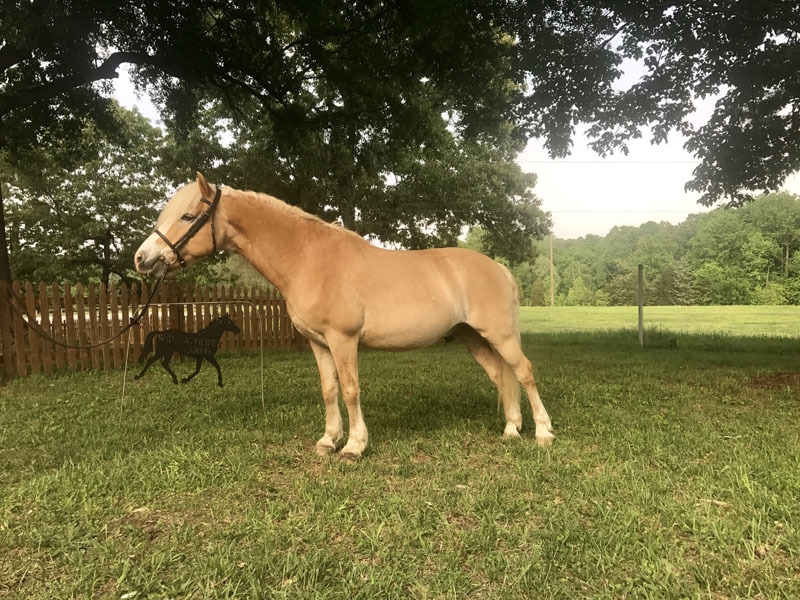 Ninja is a registered Haflinger gelding that was born in 1995. He was donated by Dana Dewey of Foothills Equestrian Center. He is short (around 13.2hh) and has a very stocky build. Ninja is built like a tank. Sometimes he forgets that and has to be reminded that he must follow rather than lead. We don’t know much of his history, but Ninja has proved to be a steady horse for our riders. He excels in the rec riding program and has proved his worth as a reliable walk/trot horse. He has an incredibly smooth conveyor belt trot that allows his riders to become comfortable trotting. They are then able to learn how to post the trot on a smooth ride rather than getting bounced out of the saddle. Ninja also loves to take his riders on the trails. This is his happy place and he is probably one of the most sure-footed horses on the property. Ninja is also beginning to prove his worth in the therapy programs both in therapeutic riding and hippotherapy. His height is loved by the volunteers and his steadiness is great for the kids. Ninja is also known as our big talker at the farm. He has quite the personality and always has to announce his presence when he enters the barn or say hello when he sees someone coming around. Odie is one of several senior citizens at our Conover location. He is a black pony who is starting to show some grey, but you would not know his age when it comes to working in the programs. He’s game for lead-line sessions and teaching kids walk, trot, canter, and maybe even a small jump here and there. One of our past clients, at nine years old, coined the name for the little pony. 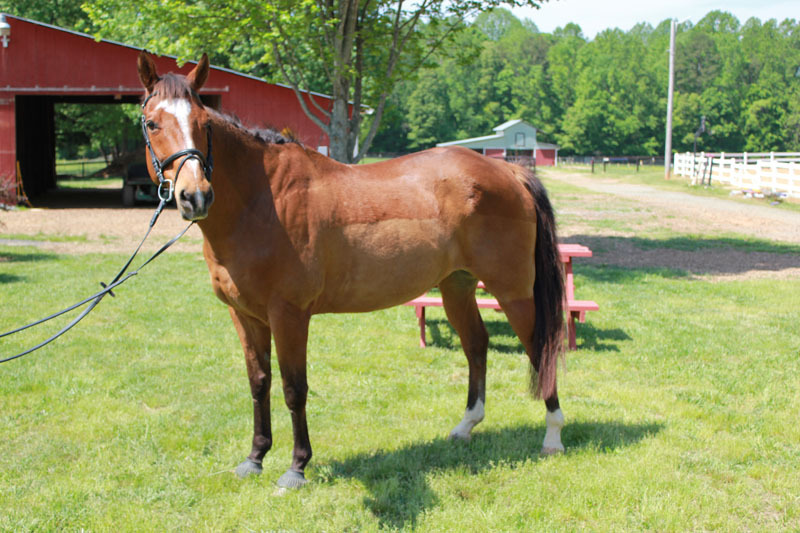 Standing at 13.2hh, Odie is a Morgan/Welsh pony cross gelding born in 1992. He is a great teacher in our recreational/therapeutic programs and even though hippotherapy isn’t his favorite thing he still helps out and his small stature is perfect for it. This silly, googly-eyed pony is a barn favorite. 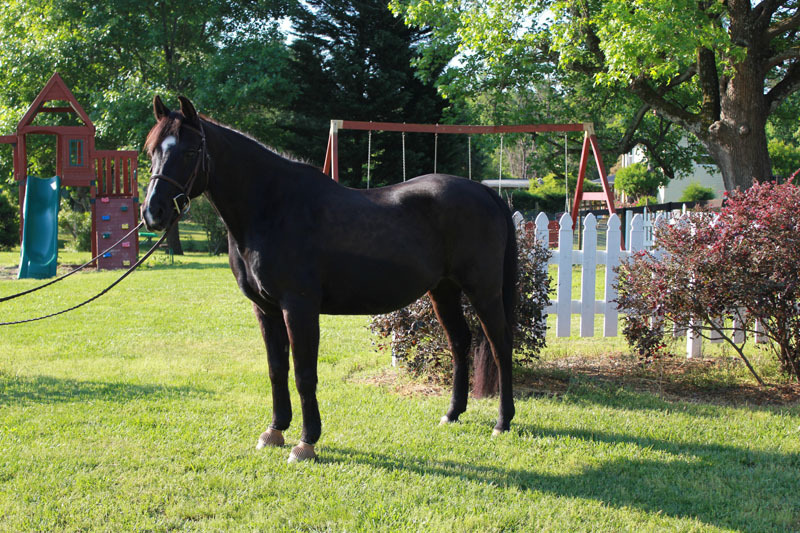 Oreo is a 14.1hh half Arabian/half Paint gelding born in 1998. 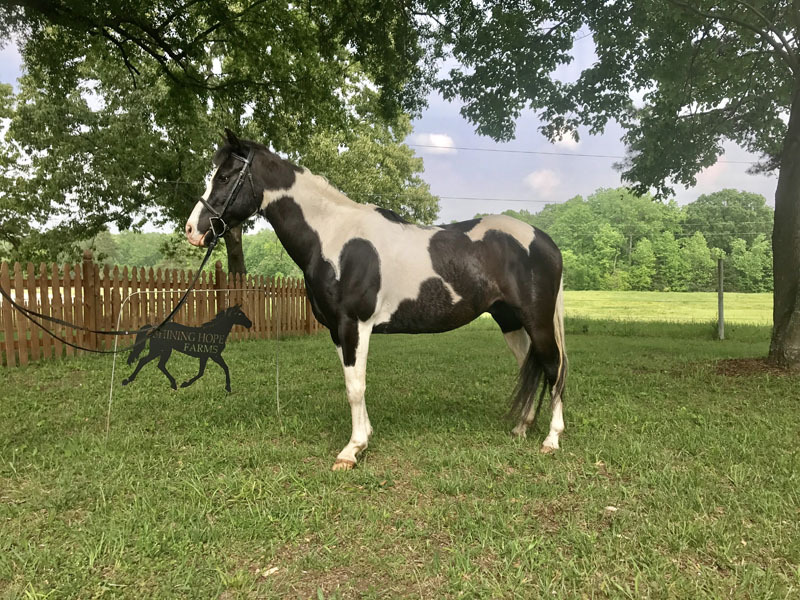 He stands out in the crowd with his black and white tobiano color, sometimes kids call him the Chick-fil-A horse! 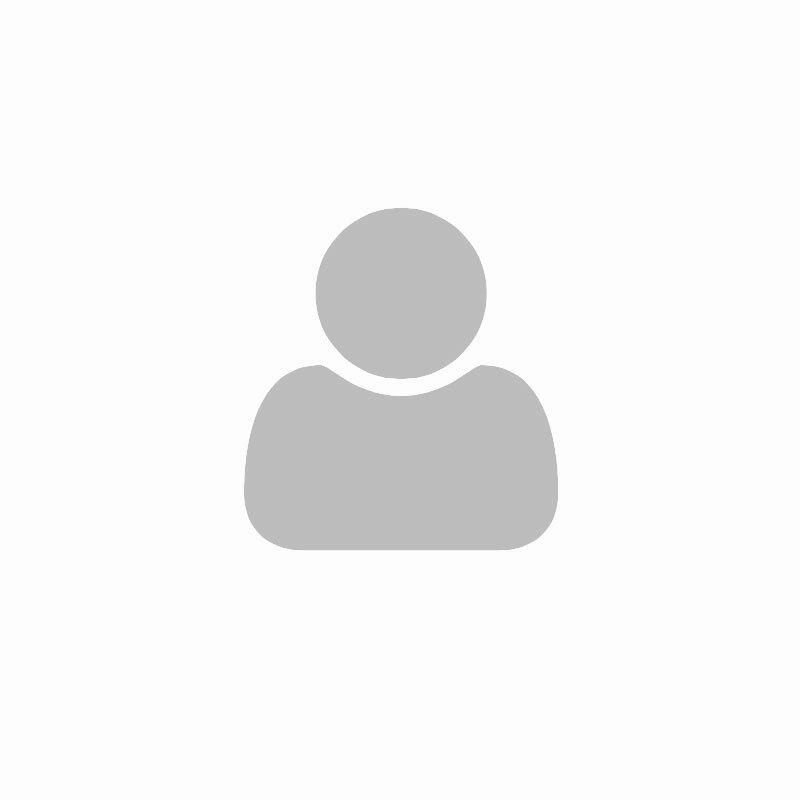 What’s neat is SHF also owns his brother – can you guess who? Oreo was generously donated by Pam Carter. Peter Pan is a 14hh Paint Pony purchased from Dana Dewey of Foothills Equestrian Center. Pan is the most recent addition to our equine staff, but is already loved by clients and staff for his lively demeanor and his cute appearance. His smooth forward movement and narrow build is a great asset to our program. Pan also proves to be quite the talented lesson pony and jumper. He is the doppelganger of Captain Hook at the Mount Holly location and named accordingly. Pan was born approximately in 2007, is therefore one of the younger equine members of our team and we hope to benefit from his partnership for many more years. 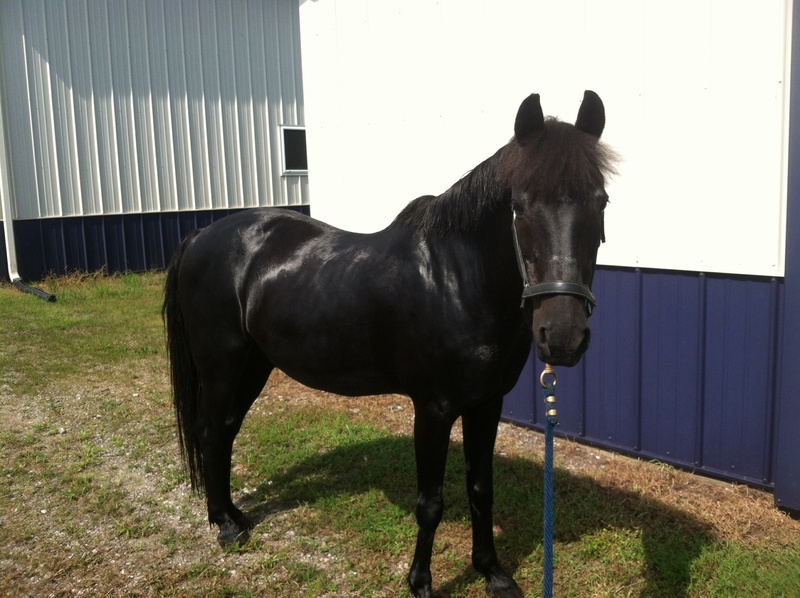 Riley is a dark black Arabian- Quarter Horse gelding and Zane’s half- brother. Born in 1997, Riley, like Zane is approximately 14.1hh tall. In his few years at Shining Hope Farms, Riley has become essential to the program, carrying one of the heaviest workloads, utilized in both recreational riding lessons and Hippotherapy. He is loved for his sturdy build, his size, and smooth gaits. Riley is also a great swimmer and cross- rail jumper. Like Zane, Riley was generously donated by Chamblee Simonsen. 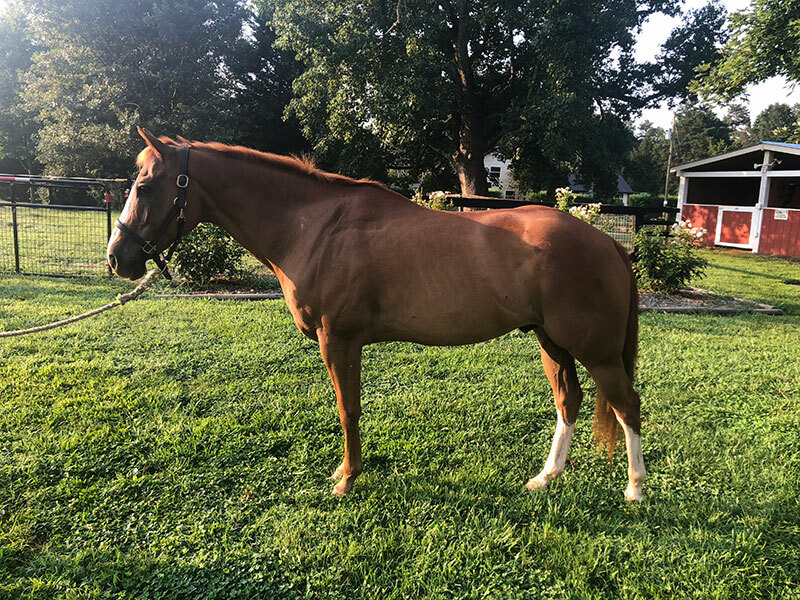 Sally is a 15 hand, bay Quarter horse mare of of undetermined age (our best guess is that she was born sometime between 1987 and 1992). She is on loan by Dana Dewey, owner of Foothills Equestrian Center (FEC). Sally comes with a mysterious past. She was found on Craigslist several years ago and wasn’t in great shape at the time. She was bought by Susan Harris (YES! The Pony Club book author and Centered Riding Instructor) who then donated her to Dana at FEC. After much TLC and conditioning, Sally has won our hearts with her sweet and gentle personality. She is blind in one eye, but it doesn’t slow her down at all. Sally has become a valuable and versatile member of our hippotherapy and recreational/therapeutic riding programs at Shining Hope Farms’ Conover location. “What’s It To Ya” aka Sammy a Welsh Pony gelding, was foaled in 2000 and has been serving clients at Shining Hope Farms since he was five years old. Sammy therefore is probably SHF’s most experienced equine. He is known to ‘lead himself’ through a therapy session, a Steady-Eddie, who is usually the go-to pony whenever a client is anxious and unsure. Sammy was born a dark black color but has since then lightened out to be a flea-bitten grey standing at 14.1 hands. He’s notorious for giving his riders a “Sammy hug” after they dismount. Sammy is one of our all-round ponies, invaluable not only in Hippotherapy and for beginner lessons, but also in the show ring, especially in Dressage. 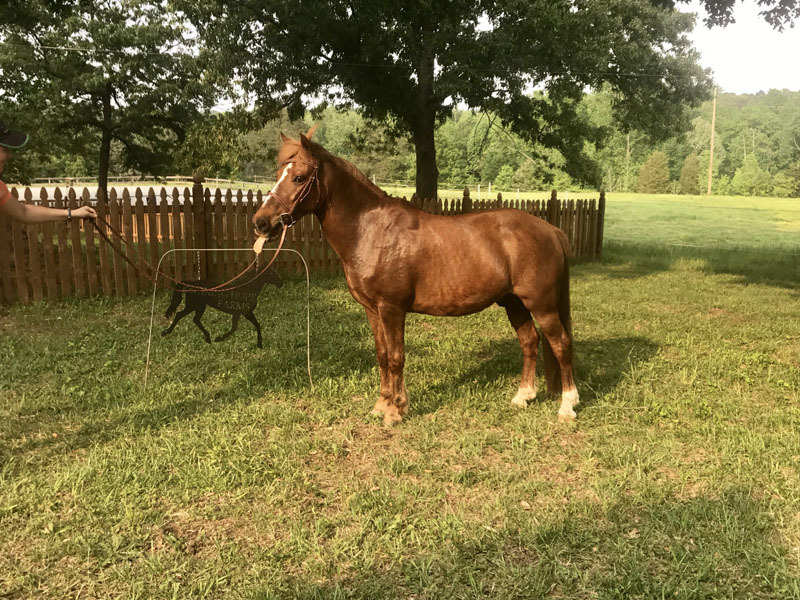 Lance – aka Sir Lancelot is beautiful appendix gelding born i 2015. Lance is in the beginning stages of training to eventually become a lesson and therapy horse! Lance was born a Dark brown color and has since then greyed out. He was generously donated to Shining Hope Farms by Holly Lewis! Teddy is a bay Gypsy Vanner X gelding born in 2012. He recently joined our Mount Holly location and has already won over our staff, volunteer, and clients’ hearts with his sweet and goofy personality- reminding us much of a big teddy bear. Teddy is already carrying a great portion of our therapy services and therapeutic riding programs at the Mount Holly location. Trevor is a 15.1hh chestnut quarter horse gelding born in 2006. Trevor joined our Charlotte location equine staff in 2018 and is already loved by staff and clients. He is known for his sweet face, gentle personality, and floppy lower lip. Trevor is Peter Pan and Howard’s best buddy and loves therapy as well as teaching therapeutic riding lessons. Trevor’s favorite thing in the world are trail rides, where he proves his braveness and steadiness. Willy is the little black pony that can do it all! Willy has competed extensively in Pony Club rallies, horse shows, and mounted games competitions before working at SHF. He’s won against much larger horses in jump rounds up to heights of 2’9”, which is much higher than his chest! Willy has brought numerous young riders up through the levels and is a fantastic babysitter. Because of his short height and experience, Willy is one of the favorites for Hippotherapy as well. 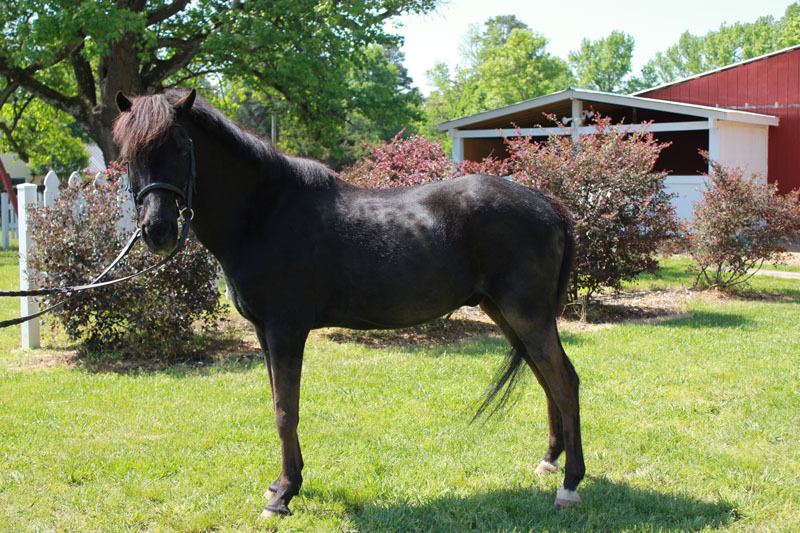 Standing at 13.0 hands high, Willy is a 1997 Welsh A Pony gelding. 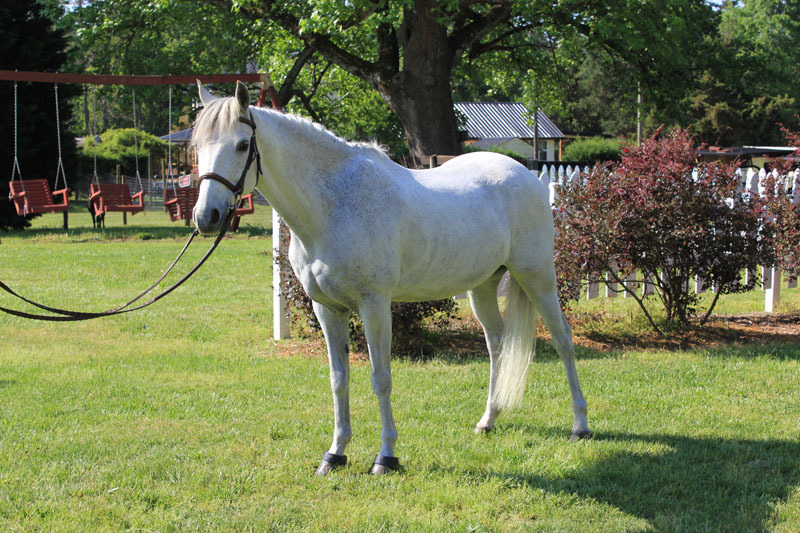 Zane is a cute grey Arab- Quarter Horse cross, known for his gentle personality. The 14.1hh gelding is a favorite in both Hippotherapy and riding lessons, loved for his great character and size. Born in 2001, Zane only became part of the Shining Hope Farms equine family a few years ago but is already essential to the program. Chamblee Simonsen generously donated Zane and his brother Riley, who lives at the SHF Mecklenburg location, to Shining Hope Farms. 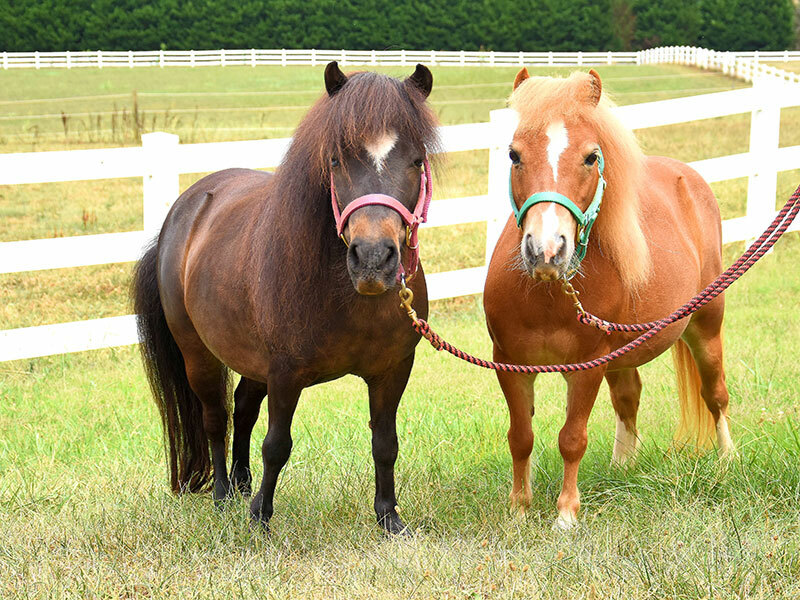 Scarlet and April are Shetland pony mares that were born in approximately 2003. They came from Personal Ponies after being generously offered to the farm by the mayor of Conover. These ponies were originally used in therapy and community events years ago, but had been out of it for a while before coming to the farm. We believe they are half sisters with Scarlet being the older of the two. Scarlet is the dark bay pony. She has a unique heart shape on her forehead and one blue eye. She has a bit more of a stocky build than her sister. She has a gorgeous thick mane and a long flowing tail to match. Scarlet’s personality is more reserved, but sweet. She was initially the more nervous of the two, but as she has settled she has become more confident and comfortable with people and her surroundings. Scarlet’s favorite thing is to be rubbed and scratched. April is the chestnut mare with a flaxen mane and tail. April enjoys being active and is the much more agile of the two ponies. She has a cute little jump that proves her agility! These ponies have been a welcome addition to the Conover farm. They are very sweet and loving to the staff, volunteers, and clients. They are currently used in ground lessons if a client can’t ride or the weather doesn’t allow for a regular riding lesson. They are a great size to teach grooming and leading to our clients. They will also be used in ground lessons, mental health, community events, and hopefully one day we will have them pulling a cart!